Sketch F No. 2 Showing the Progress of the Survey of the Florida Reefs 1849 - 1855. An uncommon 1855 U.S. Coast Survey triangulation and progress chart for the Florida Reefs, including Key Biscayne, Key West, and the Miami area. 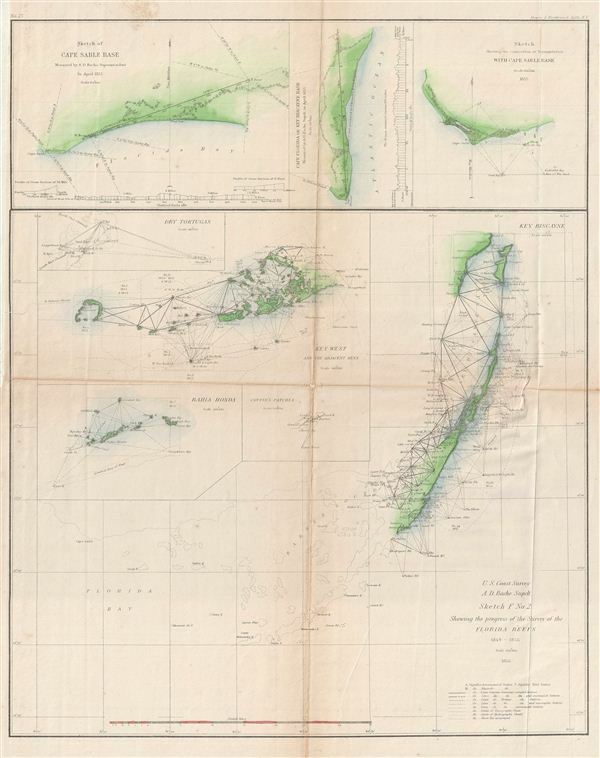 Map is divided into eight segments detailing Key Biscayne, Cape Sable Base, Cape Florida or Key Biscayne Base, the Dry Tortugas, Key West and Adjacent Keys, Bahia Honda, and Coffin's Patches. The whole was compiled under the supervision of A. D. Bache, one of the most influential Superintendents in the history of the Coast Survey. Published in the 1855 edition of the Superintendent's Report.